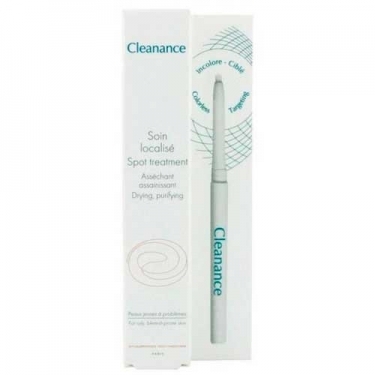 DESCRIPTION: Cleanance Spot Soin Localisé from Avène is a concealer and colorless stick for imperfections. Formulated with mica, kaolinite, and BHA Monolaurin, dries imperfections, reduces the risk of bacterial infections and helps to eliminate imperfections and control sebum production. This treatment has been tested for 7 days by 33 users with a skin problem: 100% of users found a rapid disappearance of pimples. Apply 2 to 3 times per day on imperfections.